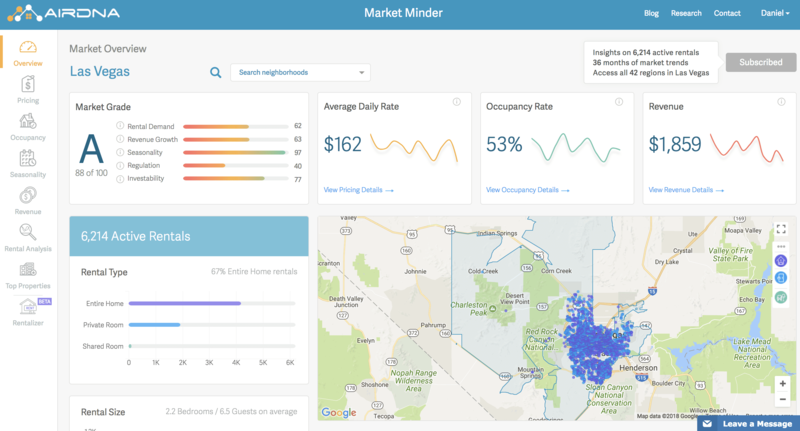 MarketMinder is a web app displaying metrics for every Airbnb rental worldwide. It can be used to understand your own market or to research other markets for future investment. It is subscription based starting at $19.95/month for more than 40,000 cities. Why am I Reviewing AirDNA? In 2011, I was researching Las Vegas to purchase my first investment property. 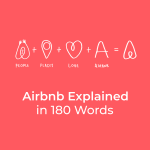 This was before I heard the word A-I-R-B-N-B so I was analyzing it in terms of long-term rental income. I knew that hotel and casino workers were renters, as were college students (UNLV). I also knew there was an Air Force Base not too far away which constantly rotates through military personnel. My research told me the city had plans to do a massive renovation to the neighborhood on the East side of the UNLV campus. I found a move-in ready 3-bedroom home with parking and a covered backyard for a final negotiated price of $83,500. I read numerous books on the process of purchasing a home and created spreadsheets to understand my revenues and expenses. I know how to analyze a market to understand if it’s a good investment decision and which neighborhood is best for this investment. I will focus on Las Vegas with my AirDNA review because of the number of worldwide travelers vacationing in Las Vegas, the number of conferences held in Las Vegas, the new football stadium moving to Las Vegas, and my existing knowledge of the market. Any location highly dependent on tourism usually is more lenient with Airbnb rentals. However, in Las Vegas, do the massive and numerous hotels hold a lot of political power that will look to limit Airbnbs in the future? All data on AirDNA is publicly available on Airbnb. Over 4,000,000 Airbnbs are tracked daily. MarketMinder is updated on a monthly basis between the 5th and 8th for the previous month’s data. Core to AirDNA is the ability to discern a blocked date as either booked or blocked. Although Airbnb obscures this data today, AirDNA was able to collect 18-months of data before that happened. Additionally, they use a system of modern artificial intelligence technology and test known blocked versus booked days to measure the degree of predictive accuracy. Revenue is based on the daily rate (and not the advertised base rate) plus cleaning fee. Additional guest fees and any last-minute discounts/premiums are not known. This is important and when I asked the company if they know how much this affects the numbers, they told me in aggregate it is a wash, but there can be a significant difference at the listing level. AirDNA defines an active property as any property that was live on Airbnb during the month and not completely blocked from receiving a reservation. Any two people looking at the exact same data set can come up with two separate conclusions, sometimes polar opposites. This is no different when trying to locate and analyze a market for investment purposes. AirDNA is a powerful tool and provides accurate information, but that information is historical. The best investments will be made when you pair historical data with the understanding of future trends of a particular location. Additionally, any two people will place different value on different pieces of information. I often get asked about where to invest. I never answer this question without at least 30 minutes of discussion as it’s personal and different for every person. My answering, even though well intentioned, could lead you down the wrong path for your own needs and end in disaster. If you cannot or do not want to invest the time in understanding how to invest, then my advice for you is to not invest. Picking a good location is just the first step. I hope that my AirDNA review will act as a guide for you in the process and show you how one person’s brain works as it related to investments in the vacation rental industry. After you identify a market, you’ll want to create a spreadsheet which identifies both the expected revenues and expenses. This is how you will identify an individual property within your chosen market. I suggest creating three revenue & expense scenarios: conservative, expected, and reach. AirDNA provides information for the revenue section. Download my revenue and expense spreadsheet: AirDNA Review – Rental Analysis. The first thing you’ll notice is a beautiful dashboard with ‘Market Grade’ section in the upper-left corner. AirDNA rates Las Vegas an “A” scoring 88 out of 100 points. You can further specify this data to be shown on a zip code basis and the numbers change a bit. While you should not place much emphasis on this when it comes to your final decision, it does arm you with additional information. And, information is king. However, this is general information, even by zip code, and the profits live in the margins behind these general numbers. Ignore ‘Average Daily Rate’, ‘Occupancy Rate’ and ‘Revenue’ charts to the right as these all have more detailed sections on the left-side menu bar. ‘Active Rentals’, the next chart, is a powerful piece of information. However, we’ll want to understand how this relates to the number of travelers arriving in Las Vegas every year. 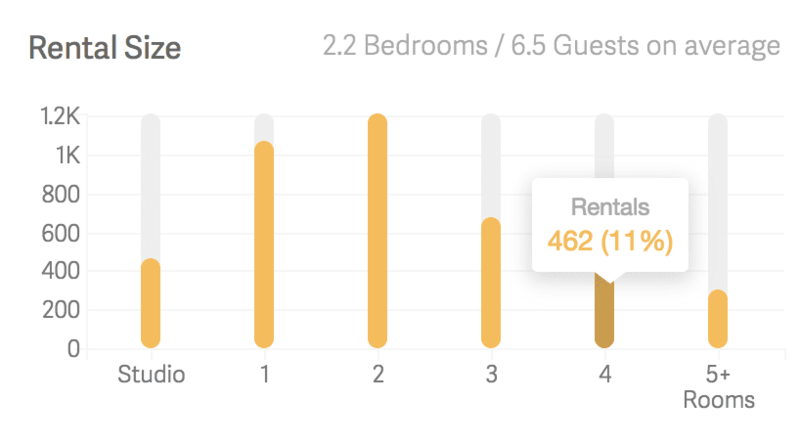 Knowing the number of active rentals is not enough. For example, let’s assume city A has 6K Airbnbs and 600k annual travelers and city B has 9K Airbnbs and 950K annual travelers. In this case, the city with more Airbnb listings is actually the better choice because there are more annual travelers available per Airbnb rental. 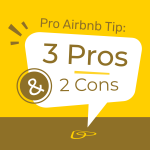 Of course, we know each rental does not get the exact same amount of travelers per year (and there’s more information to consider), but the larger the proportion of travelers per Airbnb listing, the better. ‘Rental Size’ is also tremendously helpful as it gives you a view into which size homes are being rented on Airbnb. Again, this information is one side of the coin. You also need to understand the demand for each type rental. But, there’s one thing I know for sure: demand does not exactly match the chart. One of these rental sizes is going to have proportionally higher demand than supply. In other words, there is not an exact match of 11% demand for 4 bedroom homes, 29% demand for 2-bedroom homes, etc. I will say it once more, the profits live in the margins. I would start with Studio rentals, as I am surprised they only make up 11% of the total market (the same as 4 bedroom Airbnbs). This seems low to me and I expect demand for Studios to be much higher than 11%. 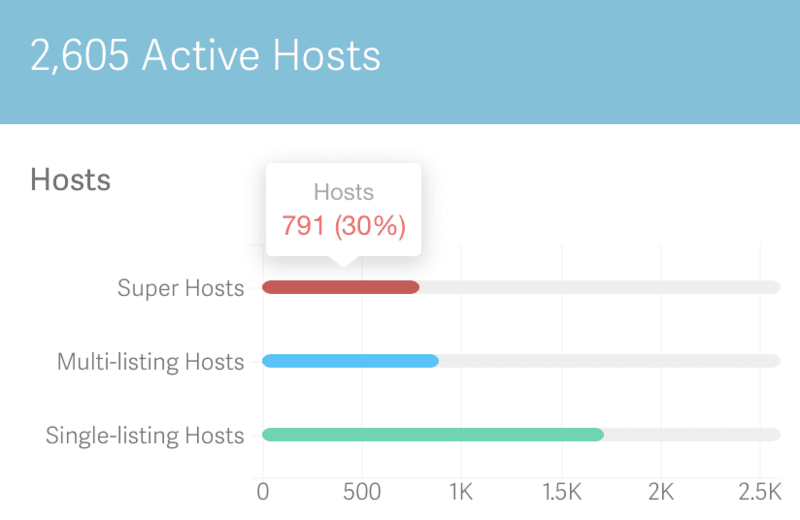 ‘Active Hosts’ provides a good bit of insight, specifically, the percentage of Superhosts. 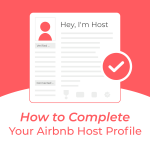 Across the entire Airbnb platform, about 5% of hosts are Superhosts. In Las Vegas, there are a whopping 30%! This means the benefit of being a Superhost is severely limited as a guest can find numerous other Superhosts to choose from. As the profits live in the margins, you can ignore the top three charts which show average rates for room types as it’s too generic of information. ‘Future Supply and Available Rates’ is powerful because it shows you the margins. How much are the highest earning Studio Airbnbs charging? This number will go in the reach revenue and expense spreadsheet scenario. This chart also shows you that weekends are most in demand. While useful and good to know, your third-party pricing partner is a master at this information so you don’t need to analyze much here. ‘Average Daily Rate’ shows there’s been no daily rate growth over the past 2 years. At first thought, this is concerning and will need to be looked into further but the variance is so wide here that this could be too general of information, even when filtered for just Studio’s. ‘ADR Range’ is going to be the key we’ll use to fill in our three revenue and expense scenarios. This chart shows you what the cheapest and most expensive Studio went for (we are filtering all data to show only Studios) every month. I like to be conservative with all my estimates so my conservative, expected, and reach scenarios would follow the 25th, 50th, and 75th percentile, respectively. ‘Booking Lead Time’, shown at the top, is very important. In Las Vegas, it’s 36 days, but in other markets it’s as low as 14 days. This means that 50% of the reservations are booked within 36 days of arrival. This information is important to know once you have a property because it will allow you to properly book your property. After all, your nightly rate is based on occupancy. So, in Las Vegas, depending on your risk level, you’ll want about 50% of days booked at 36 days out. While in a market with a 14-day booking lead time, you’ll want to be booked at 50% only within 14 days. ‘Historical Occupancy Rates’ is an extremely important piece of information. Once you have your nightly rates, you’ll need to discount these rates by the level of expected monthly occupancy. I would use 25th, 50th, and 75th percentile occupancy rates for my conservative, expected, and reach revenue and expense spreadsheet. Once I filter this chart for Studios, as expected, the occupancy rates jump up. This signals to me that there is, in fact, more demand for the number of Studios available for rent on Airbnb. We can see March is the busiest month. This is surprising to me, but it’s powerful information to maximize your ROI. Let’s say you want to plan a vacation to your home and you’re planning to go in March because you assume the summer months are the busiest. Well, if you have flexibility in your vacation dates and know this information, you would not want to go in March when you can get premium nightly rates. 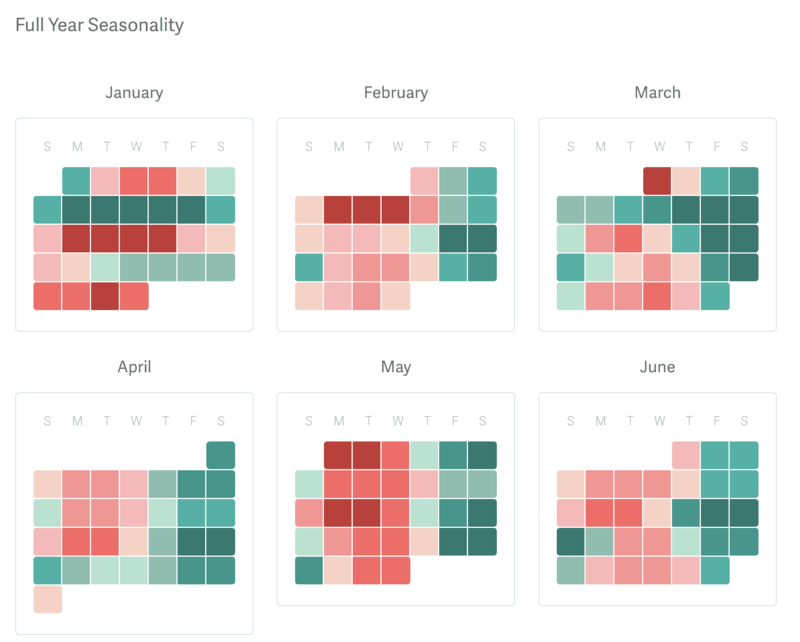 ‘Full Year Seasonality’ clearly shows there is almost year-round demand for the weekends, including Sunday. 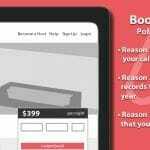 This information is best used by your third-party pricing partner to properly price your nights, but as the property owner, you want to understand the data behind the nightly rates. It also tells you when best to visit your home (ie when it’s least likely to be booked or booked at low rates). ‘Monthly RevPAR’ measures the amount of revenue per month per listing while excluding blocked dates. For example, if you earned $2,500 with 25 available nights in the month, your RevPAR is $100 (ie. you earned $100 for every available night). Essentially, it takes into account your occupancy. This is super important to know once you are creating your revenue and expenses spreadsheet to understand the potential of your property. The downside to this chart is that it’s too general without knowing where the different percentiles rank. Remember how I’ve mentioned a few times that the profits live in the margins? Well, the ‘Rental Revenue’ chart displays the margins. After selecting the listing type, size, and the number of guests, you can display the 25th, 50th, 75th, and 90th percentile. You already know your expected night rate from ‘ADR Range’ in the ‘Pricing’ section and you know your expected occupancy from the ‘Historical Occupancy Rates’ chart in the ‘Occupancy’ section. These two numbers should correlate to the 25th, 50th, and 75th percentile in the below chart. ‘Active Listings’ communicates if others have already started to figure out Studios are in high demand and, thus, are growing at a rate higher than the average. If not, it could mean our initial analysis is wrong so you always need to re-evaluate your initial assumptions. ‘Ratings’ gives you an idea of what rating areas you may want to clarify or focus on. For example, we can see that ‘Location’ is rated a 4.7. Even though a 4.7 of 5 seems good, on Airbnb, this is a failing grade. This tells me that I need to do a better job of setting expectations about the location prior to the guests reservation and arrival. The sweet spot right now that differentiates beginning to advanced hosts is about 10 reviews. If a market has many listings with more than 10 reviews, this is a mature market. The ‘Reviews’ chart shows that Las Vegas has 64% with less than 10 reviews. This is promising as you can get in and become an experienced host relatively quickly. 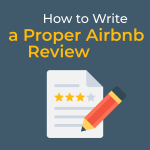 About 70% of Airbnb guests leave reviews, so if you host for 3 months with a 75% occupancy and have 5 reservations per month (average stay length of 4.5 days), you’ll already be at 10 reviews (15 reservations multiplied by a 70% review rate). If you just skipped that sentence because there was too much math, you should seriously reconsider real estate investing. ‘Amenities’ chart is very powerful to maximize your reviews and occupancy. I know that Las Vegas holds numerous conferences, both big and small, year round. I expect Business Ready listings to be in high demand, however, only 13% are classified as Business Ready in the Las Vegas market. This represents an opportunity. Additionally, I think Cable TV at 42% is low. Las Vegas is known as a party town and what do you want to do after you party too hard? You want to lounge and watch TV. Now, the lower percentage of cable could mean that most TVs are equipped with SmartTVs or that hosts simply haven’t selected this setting when they do have cable TV. 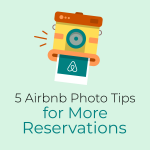 Either way, the more selections you can click off within Airbnb, the larger your pool of Future Potential Guests. I recommend continuing with the old fashioned Cable TV amenity as everyone is familiar with this, even the non-tech savvy. Another useful chart is at the bottom where it shows the Cancellation Policies and the Minimum Stay requirement. I am surprised to see that 45% have a 1-night minimum. Initially, I assumed many hosts would have a 2 or 3 night minimum to avoid partiers. This assumption was incorrect and I would likely work with a 1-night minimum in Las Vegas given this piece of information. What if you were to buy a business, but before you did you could view their revenues to identify where to start? This is exactly what the Top Properties tab shows! It’s pretty miraculous. 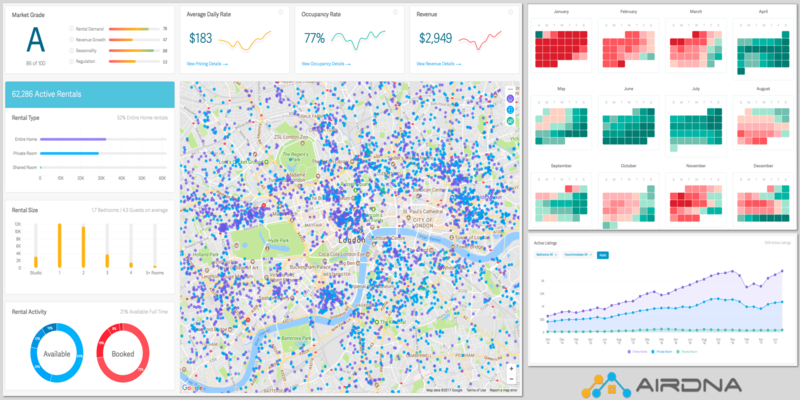 You can identify where on the map the most profitable listings are located and you can inspect the listings of the most profitable properties to identify any trends that make them top properties. Just be sure to select the number of bedrooms so make the results more in line with your targets. Also, keep in mind these numbers are based on information that AirDNA estimates. If the property is connected to a PMS, AirDNA estimates revenue on other platforms and summarizes that information here. This is why you may see a listing with few reviews, but a high income level. The best way to use this information is to identify trends that the most profitable listings are following. You can also identify the most profitable locations. ‘Rentalizer’ is equally amazing as ‘Top Properties’! Here you enter an address, select the number of bedrooms, bathrooms, and number of guests. 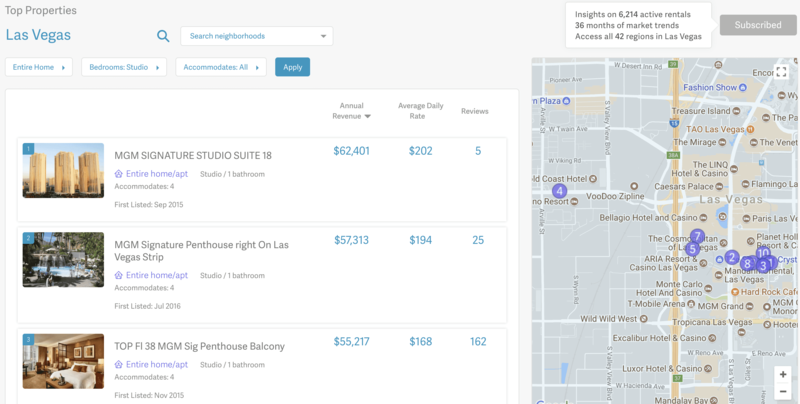 Then, it spits out revenue and occupancy info plus comparables. I entered a few addresses I am extremely familiar with around the US and found the numbers to be spot on, or a bit conservative. Additionally, you get a monthly forecast for revenue, ADR, and occupancy. AirDNA makes it easy for you to reach support by including a message tab in the bottom-right corner of every page. Over the past 1.5 years, all of my interactions have been positive and attended to within 48 hours. The customer support email is hello@airdna.co. The contact phone numbers are +1.720.372.2318 (US) or +34.932.205.569 (Spain). AirDNA has Facebook, Twitter, and LinkedIn. The first thing that became clear to me is that the information AirDNA provides is equally useful after a purchase as it is before. Going in, I assumed the information would be solely relevant up until the time of purchase. 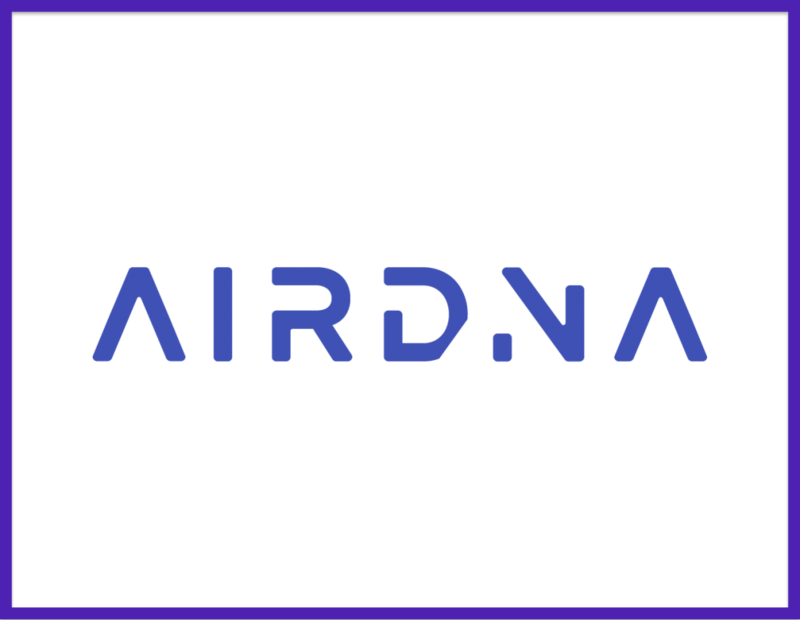 AirDNA.co is an invaluable tool because it summarizes cumulative information about a market which is otherwise unavailable. The more information you have about a market, the abler you are to make a wise investment decision. I caution anyone not to rely too heavily on the information from one source for individual investment decisions. You need to test your assumptions through many different informational sources (for example, www.RoomScore.org or a report put out by Rented.com). It should be used as a supplement to your existing research about an area. Note: Real-time future demand will allow you to see the supply of comparable rentals and what percentage of properties are booked every day going 6 months into the future (2). This feature has yet to be released, but the company told me it is being actively worked on towards completion. Have you used AirDNA? Please share your comments about your experience or on my AirDNA review.